Genealogy, DNA for ancestry, Norfolk prehistory, and East Anglian archaeology. A private journal left open. I did consider an alternative title for the post, following some more paper genealogical research ... something along the lines of From a long line of bastards. However, not all family might share my amusement of such a title. What prompted that thought was some online ancestor-chasing in one particular root of my father's ancestry. The Barbers of Swanton Morley, Norfolk. I recently reported on an ancestral root from my father's side of the family, with the surname Barber. I traced them through my crow-keeper great grandmother to villages in South Norfolk. However, I'm now on the trail of a totally different Barber family, also on my father's side, but this time from Mid Norfolk. 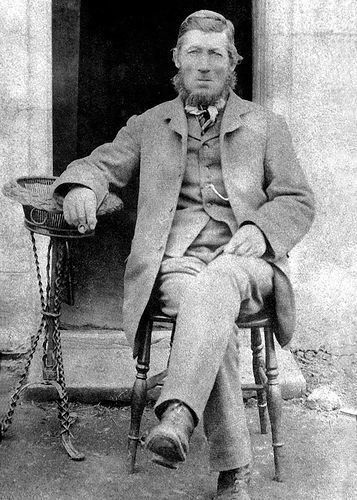 My great great grandfather, William Bennet Baxter (photograph below), married my great great grandmother Harriet Barber, at Swanton Morley, Norfolk, in 1866. Both of them had been born illegitimate at the nearby Gressenhall Union Workhouse. Their connections with that workhouse didn't end there. Their first two child Jemima, was also born there illegitimately. Later family members also had connections with that workhouse, that now houses Norfolk Rural-Life Museum. I often like to think of that building, as the Family Home. I knew that William Baxter's mother in 1846 was an Eliza Baxter. She must have had to face the shame of wearing a yellow jacket in the workhouse, to signify that she was an unmarried mother. She may have also been excluded from the workhouse Christmas dinner, as another shaming. I've recently discovered that her parents (my G.G.G grandparents) were a Samuel and Frances Baxter (nee Shilling), of nearby East Dereham, Norfolk. Moving back to the Barbers, starting with Harriet Baxter (nee Barber). She was born at Swanton Morley circa 1847. She appeared on one census in Swanton Morley as a young girl, with her grandparents, James and Jemima Barber (nee Harris). She is named there as a granddaughter of James. However, who was her mother? I'm missing a generation. She was born at the Union Workhouse, and I'm fairly certain that she was illegitimate, and that with the census information, suggests to me that her mother was a daughter of at least James Barber. So I start searching parish registers for Swanton Morley. It turned out that G.G.G granddaddy Barber, was born as James Alderton Barber in April 1803 at Swanton Morley. He married at least three times. The first marriage I can't find. The second was my ancestral, he married G.G.G Grannie Jemima Harris at Swanton Morley on 6th December 1825. She gave him at least seven kids, although at least four of them died young. Then at the age of 58 years, she died. He married again before 1861. Later he had a wife called Amelia. James had seven children by Jemima. One of them must have been the parent of my Harriet. Which one? I believe that she was illegitimate but carried the Barber surname until married. That suggests a daughter of James and Jemima. They had at least four daughters - Hannah, Frances, Jemima (twin of James junior), and Mary Ann. On checking the burial register of Swanton Morley, things narrowed down. Hannah had died as an infant. Jemima died age four (her twin brother died age seven). Mary Ann died as an infant. That only leaves Frances, born 1830 at Swanton Morley. However, it's bad to assume too much in genealogy, so I've decided to pay out for Harriet's birth certificate from the GRO in London. I should have my answer in a few weeks time. All of the child deaths that you see in these 19th century families. It does sometimes knock you back as you uncover them. The poor health, lack of welfare, and shear poverty that families had to endure then. I've got to wait for that certificate to arrive, in order to verify which of James's children was the parent of my Harriet. However, I went back on the lineage a bit further, and it gets interesting. G.G.G Grandad James Alderton Barber was born illegitimately in Swanton Morley on the 28th April 1803, to a Sarah Barber. He was not alone. Between 1803 and 1818, my G.G.G.G Grannie Sarah apparently had at least six children, all baptised and recorded as illegitimate! I'll never know the full story, but somehow she survived unmarried. The first two children carried the middle name Alderton, perhaps suggesting that was the name of their biological father. A later child carried the middle name Maris, and another was named Sissons Barber. All could suggest a number of biological fathers. All were born in Swanton Morley. I feel a little embarrassed talking about illegitimacy as a subject. It is no longer seen as something shameful, nor should it be - but it was seen as sinful and irresponsible for a very long time. The status no longer exists in the 21st Century, with the changes in family structures and a shift away from religion. That it was treated as so shameful now sounds outrageous. A side effect of a religious and hypocritical society - taking it out on children, and on mothers. So when I see an ancestor living in a small Norfolk village during the Napoleonic period, I wonder how she lived, what happened, how was she seen, did her children survive? She may well have been a colourful ancestor, and the talk of the village. Or she could have been the tragic victim of abuse? The illegitimacy wasn't restricted just to her generation. As I said, her great granddaughter Harriet was also most likely (waiting for that certificate to confirm) illegitimate and born in a workhouse - as was Harriet's husband, and their first child. Poverty, hypocrisy, and infant mortality. The great Nineteenth Century. I thought that I would celebrate my thirtieth run with the dogs, on my return to fitness campaign, by taking them a little off their usual track. I do try to vary our running routes, although living in the Fens, where farmers are queuing up to shoot you for stepping off the public road, it's not really that easy. 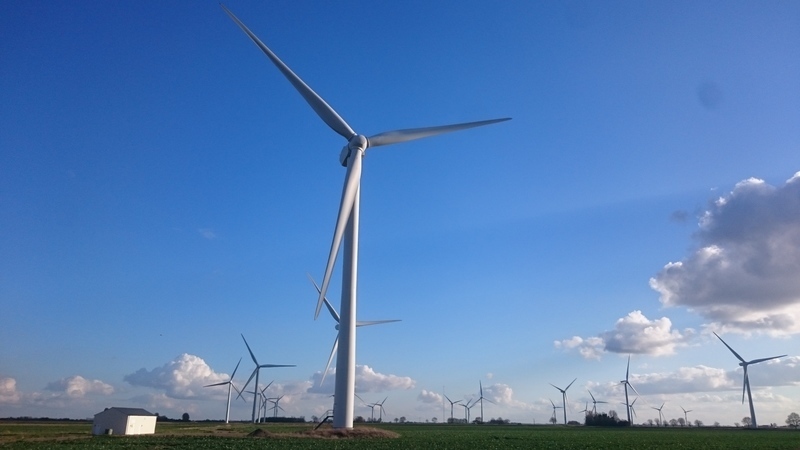 So I took them (with the lurcher protesting that he needed to stop and sniff/piss even more than on normal runs) on an 8.1 mile linear there and back run down to Coldham Windfarm. I had to climb down the steeply cut banks through stinging nettles, and literally pull the quivering dog out. What a strange dog. 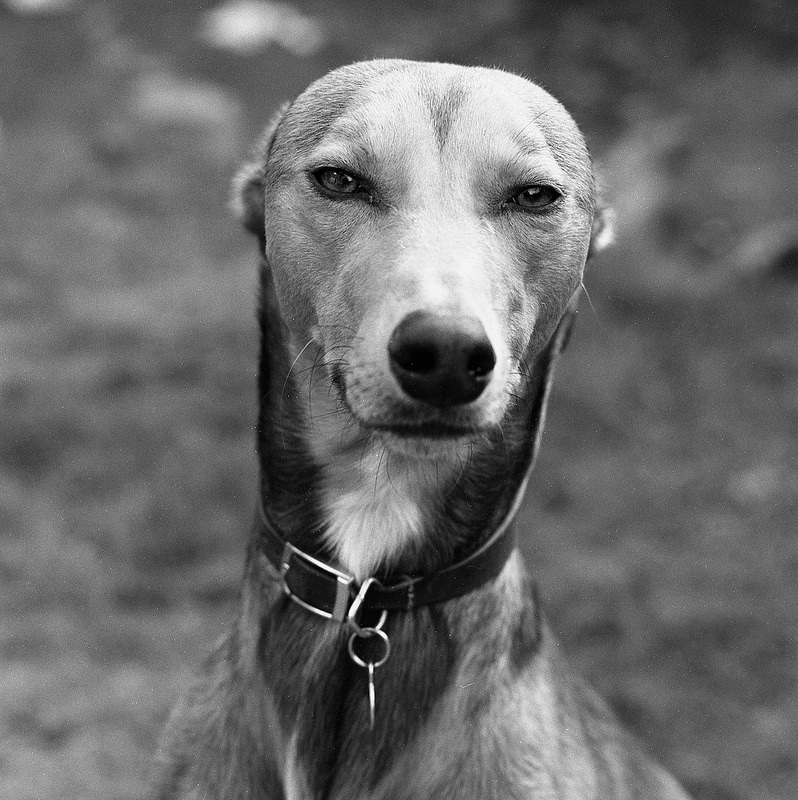 The whippet wasn't at all bothered. 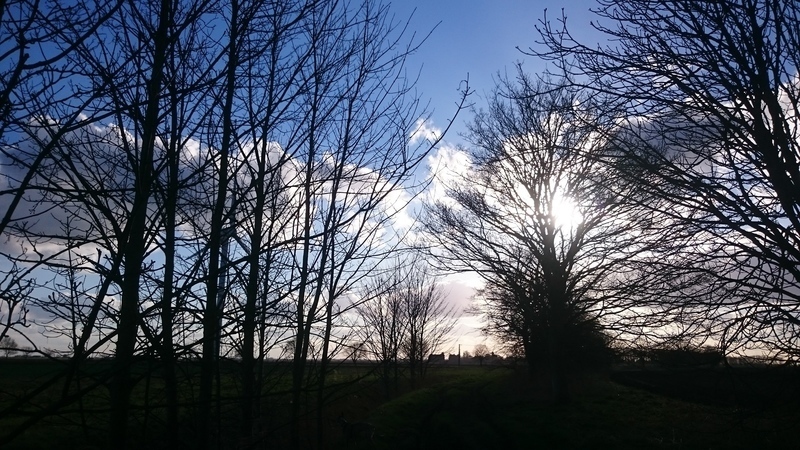 All photographs taken during the run using my Sony Z3 phone cam - unedited. 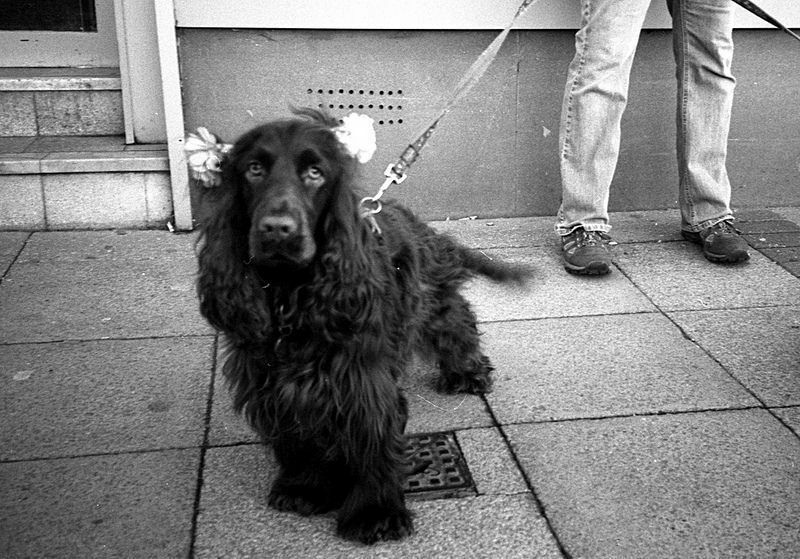 The above photograph was captured on my favourite little Olympus XA2, loaded with Rollei retro 400S film. I have been really concentrating the past three months on compact camera 35mm b/w photography. On one hand, I use the Yashica T2 AF compact, loaded with Kodak Tmax 400, that I then develop in Kodak Tmax developer; on the other hand, I use the XA2 loaded with Rollei Retro 400S, that I usually develop in Ilford LC29. 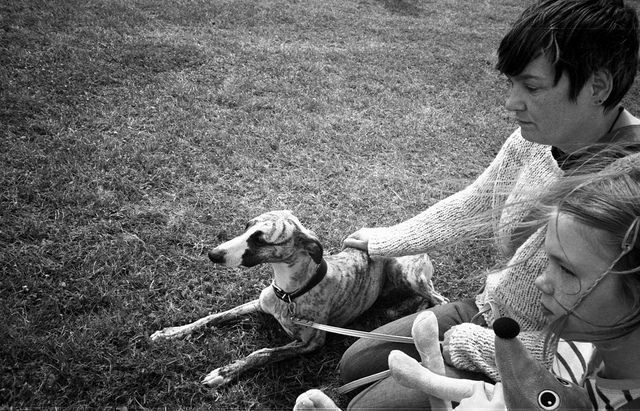 The Tmax camera produces smooth, clean, "nice" b/w negatives. The Retro 400S camera produces high contrast, rough and ready negatives, that often suffer from underexposed / under developed - but above all, high contrast and grainy. On the latest couple of films, I've been setting the XA2 exposure one stop up to ISO 200, and I've added a minute to developing time. They look better. However, it is because Retro 400S looks so odd and high contrast that attracts me to it. It makes interesting images. The film (as I understand), was initially produced for aviation aerial photography, and has near infrared range - for better cloud and mist penetration. Even with no infra red filter, it produces some interesting infra red-like results. I like it so much, I recently bought a ten pack. I've just completing my 23rd run in the campaign. 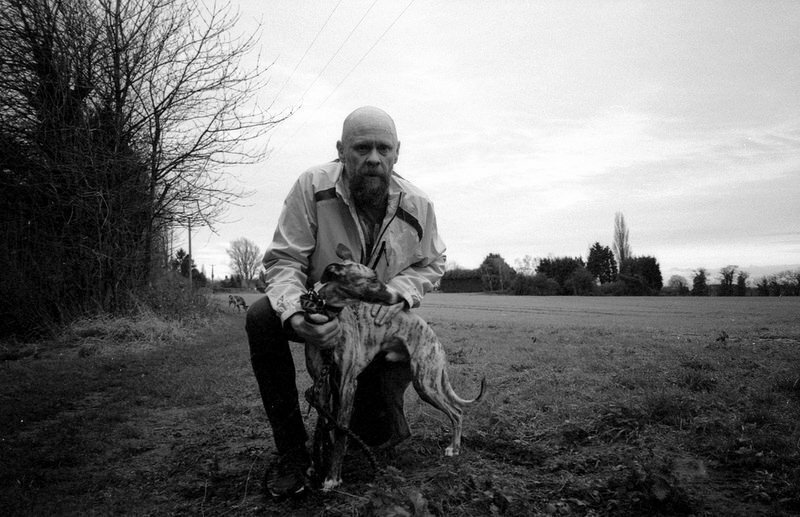 Last month, with the dogs, I ran over 60 miles. Go our canicross team. I feel pretty confident at keeping it up. I have let the strength training go, but I'll pick that up again when I feel ready. Nutrition plans, I've been pretty good. Okay, I slip a little from time to time, but I have eaten one hell of a lot of vegetables and fruit over the past three months. Weight loss really slowed down after losing a stone and a half. I'm lucky to lose a pound a week. Still, I'm not going to let it put me off. This is a long term thing, not just a weight loss diet. 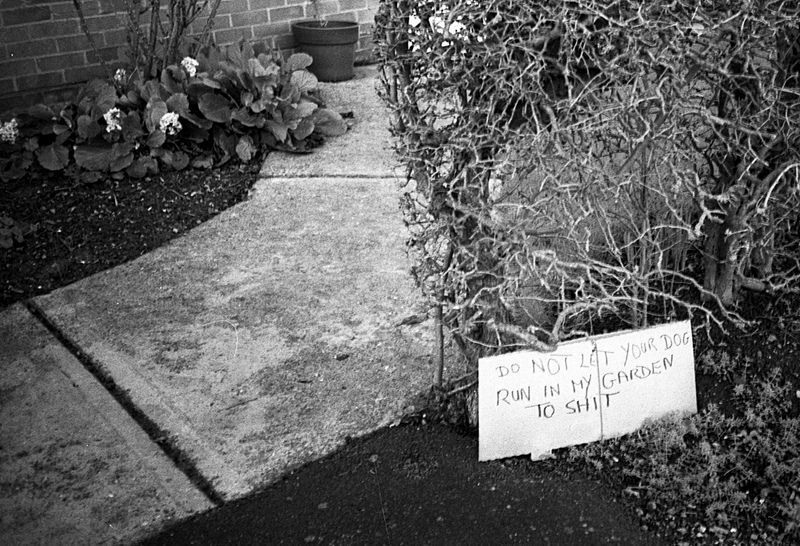 The below image is from Rollei Retro 400S in the XA2. Right at the moment I'm feeling a little concerned and annoyed with 23andMe.com. I don't think that they are really looking after their European or outside-of-the-USA customers as well as they should be if they are serious about our markets. All information, updates, and shipping appear to be two class - USA, and Others. I'll let this journal know how it goes, and to be fair, it is early days. On the paper maternal genealogy chase, I have today received from the GRO, a copy of the marriage certificate between my great great great grandparents, Reuben Daynes, and Sarah Quantrill, on the 26th April 1848, at Besthorpe parish church. Reuben's father is confirmed as Reuben Daynes (senior). It tells me that Reuben Dayne senior was actually a publican. Sarah's father was a Robert Quantrill, a labourer. In my search for my mtDNA line, I must return to the Norfolk Record Office next, and search for a family of Quantrill's, headed by a Robert Quantrill. On more than one census, Sarah claimed that she was born at Wymondham, Norfolk, around 1827. I'll first look for baptisms of any Quantrill children in Wymondham or Besthorpe, around 1815 - 1840. I have seen what may have been my Sarah, staying with a family of Long's in Wymondham, age 13, in the 1841 census. 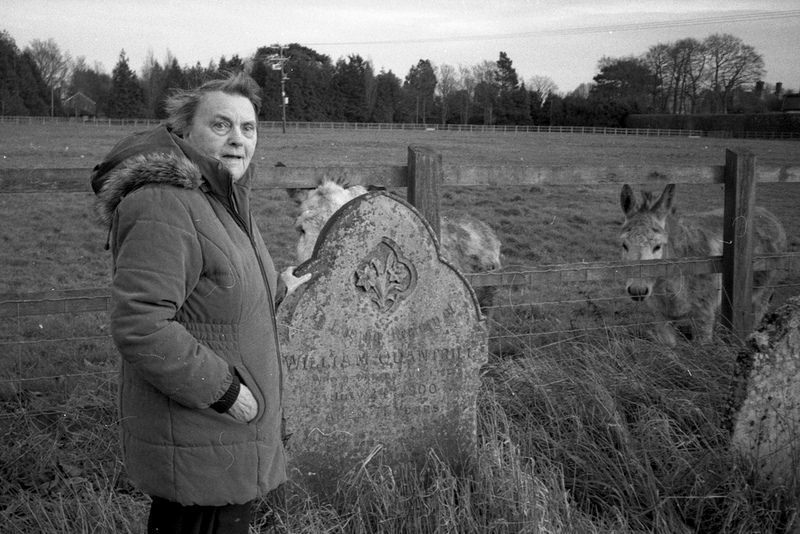 The above photo, taken on the Yashica T2/Tmax 400 film, is of my mother, my surviving mtDNA donor, standing next to (not the donkeys) a headstone for a William Quantrell. I don't yet know if he was a relative, but this is at Besthorpe church last week, and this William was several years older than my Sarah. He could potentially be an older brother of Sarah, and therefore my G.G.G.G uncle. If he indeed is, then his bones in that graveyard would contain the same lineage of mtDNA as myself and my mother here. I made this Go Pro video today, on Running with dogs No.21. 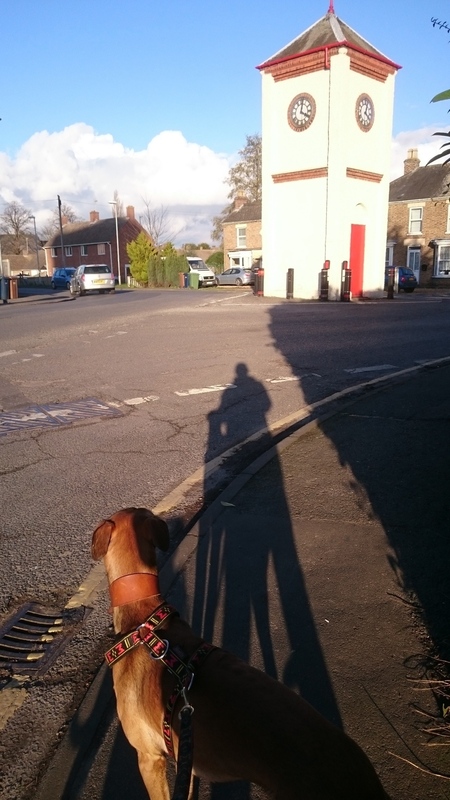 We ran the dog's default and favourite route again, around 4.6 miles long. Not a great average speed, but as you can see, we were also film making. I cut the video down to less than ten minutes this time, and I fitted the lurcher with the Go Pro dog harness, for when I ran him off leash. Otherwise, I used the chest harness. I had no idea that naughty dog went into that drainage ditch until I watched the video at home. Canicross Team Elmewych member Flint, is a three and a half year old saluki lurcher cross, bought from travelers working stock. A striking, elegant, tall, and well muscled smooth coated lurcher with more than a hint of saluki heritage in his physique. Flint is at his finest off the leash - he runs with incredible speed, jumps wide ditches with grace. It seems incredible that he is submissive to his young whippet team mate, but he certainly is! In the house: A fearsome watch dog, constantly looking and listening for intruders. He can be grouchy, overly defensive, and I don't trust him on the leash with larger dogs. Smaller dogs on the other hand - he adores and fawns. Perhaps I should have socialised him as a pup with more friendly big dogs? He might be tall and muscled, but he never packs a gram of body fat - it all goes into muscle, and however much I feed him, his ridged cheetah-back and ribs still stand out as though he is half starved. Despite his grouchiness - he still likes a cuddle on the couch. On the canicross line: certainly not a natural, he needs frequent commanding and shouting, otherwise he wants to sniff every lamppost, piss at every tree. He can be hard work on a line. What worries him? Maybe that he'll run out of urine, otherwise big dogs, wheel hub caps (see the below video), and bits of paper laying on the pavement. Off lead in the field: This dog lives to run. A joy to watch, so much speed, moves through long grass with ease, jumps over ditches with ease. I don't know what to call our canicross pack / team? Technically I bought both dogs for Anita, so they are more her dogs. How about Team Elmewych? Anyway, today's pack profile is Loki. 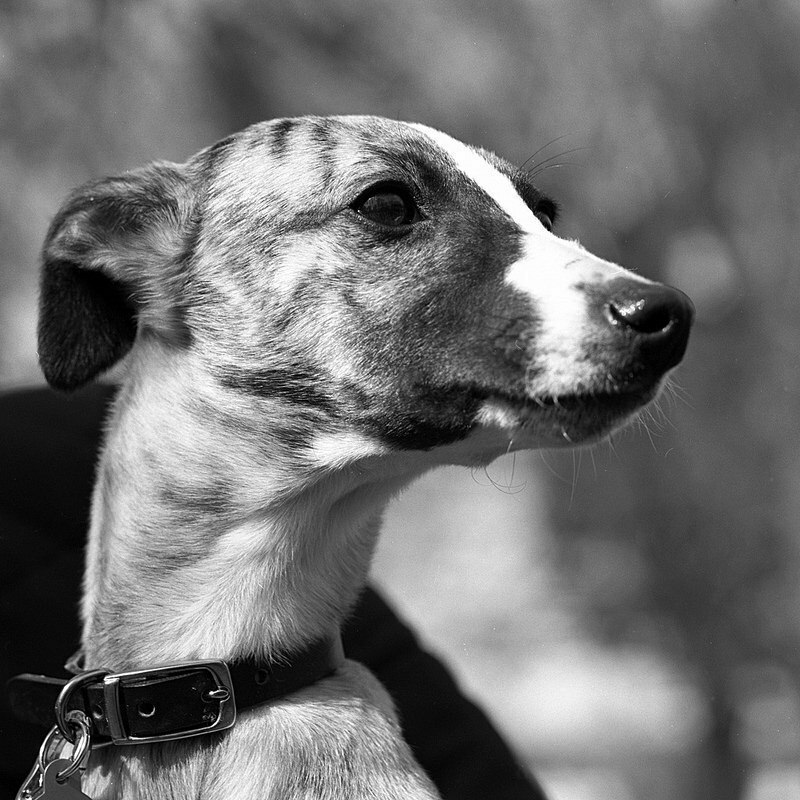 Named after the Norse mythological figure / deity, Loki is a twelve month old whippet. Although he gets excited before a run, and puts his little heart into it, he can be quite the couch potato at home. He didn't show an awful lot of aerobic interest as a youngster. While his team mate was jumping ditches from a pup young age - Loki was a bit slow off the take. Still, he is making up for it now. In the house, a couch potato, but also the dominant dog, the alpha dog - terrorising Flint, although Flint is twice his size and packed with muscle. If I give the dogs a chew each, it isn't long before Loki is sitting guard over both chews. Off lead in the field. 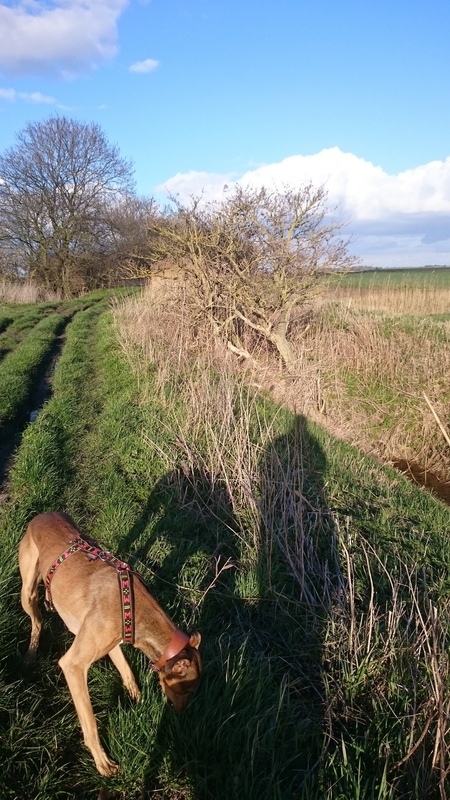 As I said, he was a slow developer, but now charges after Flint, almost keeping up with the big saluki lurcher, jumping across wide ditches, a cracking little dog, although without Flint or a crow to chase, I suspect that he'd slow down a bit. When Flint wanders too far - Loki returns to my side, trots next to me, looking concerned that Flint is out of sight. Not a bad dog at all. I just can't understand how some people go out running for fitness - and leave their dogs sitting at home. It seems perfect logic to me, that you can exercise yourself and your pooches at the same time. It also gives you the chance to bond with your dogs, in a way that benefits all. 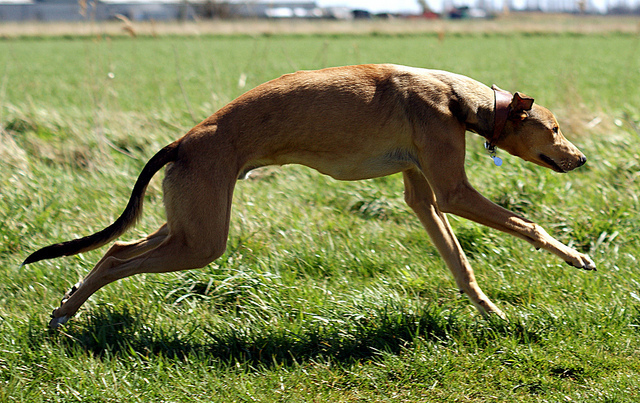 Canicross (Cani-X), is the activity of simply cross country running with a dog or two, harnessed to your body. The dogs wear suitable activity harnesses (I swear by the Manmat H harnesses over the X back style), attached via a bungee enforced line, with clips to a runner's canicross belt. The trick is to train the dogs to trot ahead at your comfortable running pace. Strictly speaking, it is organised as a competitive event, but there is no reason that it cannot be enjoyed purely for pleasure and fitness. I first started running (and competing) canicross, years ago with a Siberian husky, and also later, with a dalmatian. I ran this style for around four years. Things happened in my Life, and I became separated from my dogs. Without them, I lost my pack, my confidence to run, and slowly, my fitness. Over the past four years, my health has started to go, I'm aging, and I'm overweight. I started canicross running again at the beginning of December. We've completed twelve runs now - each three and a half to a little over four miles long. I'm feeling so much fitter - and younger! With a healthy living plan, I've so far lost 22 pounds of weight. Meanwhile - the dogs are looking fit and happy. The above far too lengthy GoPro video was recorded last week on Run.11. I eat fish, and play the mandolin very badly.